The best news. As if you hadn’t heard, Amed Rosario, midseason #2 prospect in baseball, was promoted on Monday, minutes after the trade deadline passed. 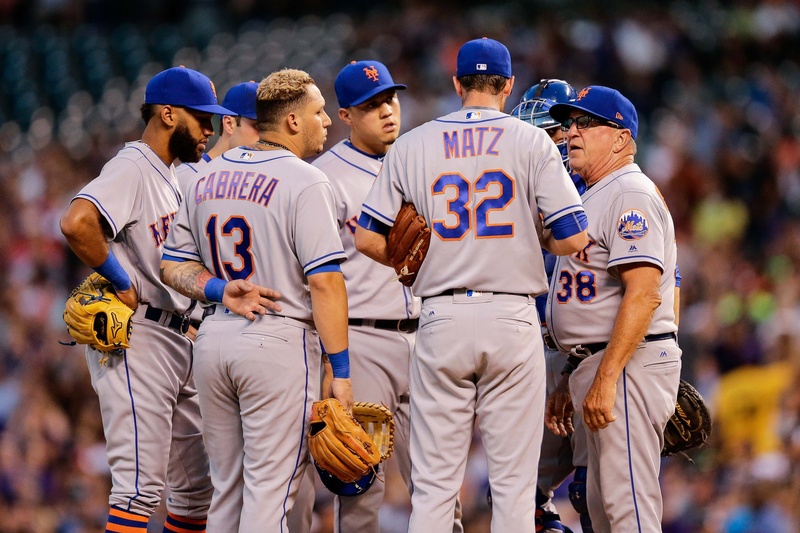 Purportedly, it was Sandy Alderson’s plan all along to delay calling up Rosario “until the roster had solidified.” Alderson’s strategy, however, may not extend to instructing his manager how to use the touted rookie, as manager Terry Collins has already indicated that Rosario will occasionally sit behind Asdrubal Cabrera and Jose Reyes. If Terry’s treatment of Michael Conforto is any indication, Rosario’s going to end up on the bench far more than we’d like. MEANWHILE, Rosario got his first major-league hit and was charged with his first major-league error. Rockies 5, Mets 4. Rosario aside, there was nothing new here. Steven Matz gave the Mets four no-hit innings, then a two-hit inning, followed by an undefined portion of a four-hit inning in which he got yanked. Matz failed to pitch past the fifth for the fifth consecutive start, during which time he’s seen his ERA rise from 2.12 to 5.50. Michael Conforto reached base in four of his five plate appearances — two singles, two walks, and a hard line drive to right-center that was caught. He’s now sitting on an OBP north of .400 for the first time in his major-league career. I’m going to keep doing this, by the way… Since July 1, Conforto’s triple-slash looks very close to Aaron Judge’s full-season line. See what nice things happen when you let the youngsters play? Yesterday’s result emphasizes why Sandy Alderson acquired nothing but hard-throwing relief prospects when he traded Lucas Duda and Addison Reed. Paul Sewald, Jerry Blevins, and Hansel Robles combined to allow two runs and six hits over the final three innings to blow the lead and then the game. Robles finished the eighth inning and was asked to pitch the ninth. He promptly walked Charlie Blackmon. To his credit, Robles got DJ LeMahieu to ground to short on a hit-and-run attempt, but Rosario got his feet tangled on the play and booted the ball. That set up Robles against Nolan Arenado, who blooped one into short center field for the walk-off. Collins must have been saving new closer A.J. Ramos for the 10th. Amed Rosario’s second-ever MLB game! Chris Flexen’s second-ever MLB start! The Mets face Tyler Chatwood and the Rockies tonight at 8:40 p.m.
Just a note that the official scorer changed the Rosario error to a hit. So no Mets errors in this game. The hometown scorer unsurprisingly decided to boost his player’s batting average at the expense of the visiting pitcher’s ERA. Let’s not debate the existential question of what is an error, but instead agree that Rosario — highly touted defensive upgrade over Reyes/Asdrubal — should have made that play.